A world-class commercial, industrial and cultural city, Chicago functions as is a major national center and as the major regional center for America’s heartland. It originally emerged as a transport center for cargo headed west and agricultural products headed east by land and water. Although transportation technology has changed, the role has not. The city is the most important passenger and freight transport hub in the country with the largest number of air departures and the most rail traffic in the nation. The commercial and manufacturing economy stands out both for its size and diversity. Over 30 Fortune 500 companies in an assortment of industries have headquarters here. Factories and warehouses extend for miles from the downtown area. Chicago is also a major center for small manufacturing and business. There is probably no more diverse an economy in the country. The city grew up in America’s Gilded Age and the prosperity spilled over into some of the finest neighborhoods and architectural statements in the country. Oak Park, where architect Frank Lloyd Wright started his original studio, is a museum of residential architecture. It is an attractive, typically-Midwestern commuter enclave of square city blocks, stately homes with shaded streets, and a shopping area next to the rail station, which still functions as an important commuter terminal. This story is repeated frequently; Riverside to the south is similar but with flowing curved streets and a park like setting designed by Frederick Law Olmstead of Central Park fame. The city has an extraordinary sense of history and historic preservation. Many architectural styles, both commercial and residential, were invented and first used in Chicago, and the city goes out of its way to preserve them. The old 1880’s elevated rail line continues to operate around the “Loop,” the city’s main business district. The former Navy Pier on Lake Michigan has been restored into a popular entertainment complex. The waterfront Soldier Field was recently remodeled at great expense rather than replaced by a larger stadium with modern amenities. In short: The city is a living museum and monument to American urban history. Chicago is also a city of neighborhoods. North side, west side, south side—each provides a set of neighborhoods to suit any taste and (mostly) any budget. Areas of older homes and “two-flats” have been restored into viable neighborhoods on major arteries in the inner suburbs. Along the lake and to the north are wealthier areas and the community of Evanston, home of Northwestern University. Areas become more typically middle class (but still with variety) to the northwest, west, and southwest. Like many large cities, Chicago has its sprawl and growth issues, and suburbs have overtaken many older farm communities and towns like Elgin and Aurora, and there is little in the way of geography to restrain the push. Naperville, due west and strategically located among the area’s beltways, has become something of an exurb, with a strong commercial base attracting commuters from other neighborhoods in all directions. Joliet is an older industrial and transportation hub on the southwest side. The rest of the area map is a patchwork quilt of suburbs, one after the other, defined by rectangular grid arteries sliced through by radii mainly along rail commuter routes emanating from the city. The more popular suburbs typically lie towards the northwest. Some have pushed far out into old farmland, like Cary, Algonquin, Geneva and the more upscale Lake Zurich, while other quality neighborhoods lie closer in, like Elk Grove Village and Schaumberg. 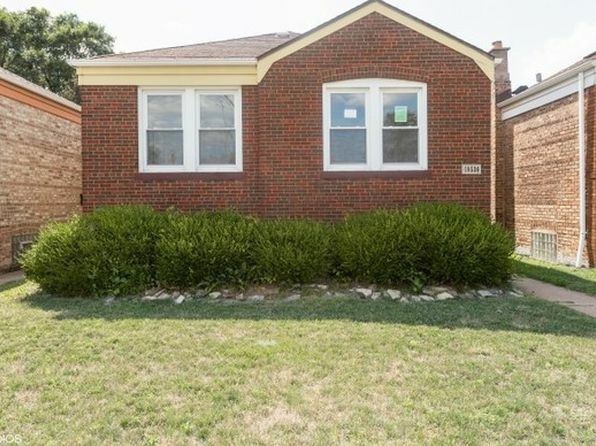 Good neighborhoods also lie to the south and southwest side, although contrasts are stronger between the livable and more run down areas; Hinsdale and Orland Park are more upscale picks on the southwest side. In Chicago, location relative to major transportation routes is most important. Many endure hour-long commutes into the city and around its crowded beltways. The city has an excellent urban and suburban transportation network with an assortment of rail and bus services; nonetheless, traffic along arteries and beltways can be intense. A less typical urban problem is that Chicago’s downtown and nearby neighborhoods have become so livable—and so many businesses have located on the urban fringe—that rush hour traffic affects people commuting out of the city. Chicago offers numerous amenities. Museums, notably The Art Institute of Chicago, and the performing arts are top quality. Sports are legendary—whether the teams win or lose—and Wrigley Field is another of those American urban icons. Few cities have more or better restaurants. Plus, the area has some of the best higher education in the country, and quality education is available at all levels in most neighborhoods. Climate and the “C” factors typical of large city living—cost of living, crowdedness, crime, and commute—are the main negatives. Chicago’s climate can be pleasant but downright miserable at times. The lakeside location, facing into the teeth of the storm track, and continental climate from the northwest produce cold, snow, wind, storms, humid heat, and weather changes invigorating for some but intolerable for others. Cost of living varies by neighborhood and lifestyle, but is accelerating after years as a relative bargain for a big city. The violent crime is still a problem in some neighborhoods. There are still some grubby, rundown areas that would make some people think twice. These facts hurt the statistical appraisal of Chicago. But we think the area offers a rich and complete assortment of lifestyles, amenities and opportunities for most people willing to make a few tradeoffs; most shouldn’t be discouraged by the low ranking. Chicago is located on a level coastal plain generally less than 100 feet above the lake. Most land is open and almost completely flat with occasional areas of deciduous woods. The climate is continental with frequently changing weather and is invigorating to say the least. Although lake winds can be strong and channeled by downtown office buildings, the nickname “Windy City” is a bit of a misnomer as average wind through the year is not exceptional. That said, winter wind-chill factors can reach extreme proportions. Summers can be warm and breezy to hot and humid. Lake breezes may moderate downtown temperatures 10 degrees to 15 degrees but will only occasionally extend several miles inland. Summer precipitation comes mainly from thunderstorms and can be heavy. Winter precipitation may arrive as frontal systems from the west or heavy squalls off the lake. Fall and spring are changeable, and along with winter, can have long periods of precipitation. Half the summers have temperatures over 96 degrees, half the winters have temperatures as low as –15 degrees. First freeze is mid-October, last is late April. 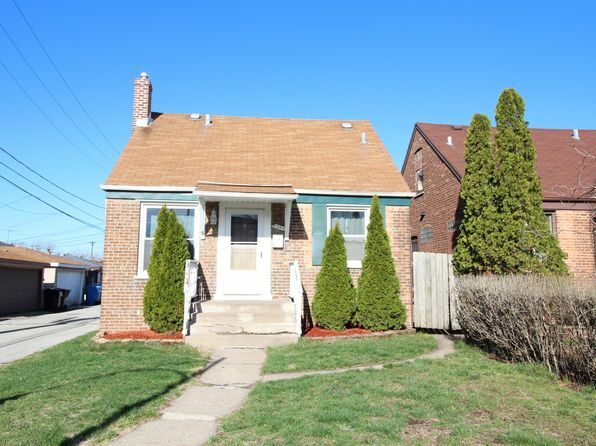 The median home price in Chicago is $120,800. Browse Homes in this Range. 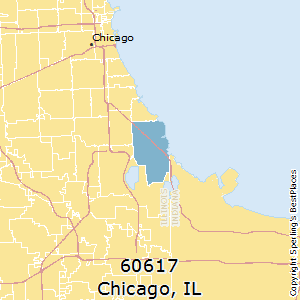 Compare Chicago (zip 60617), Illinois to any other place in the USA.